Lock down your secure audio transmissions regardless of where the transmission originates. 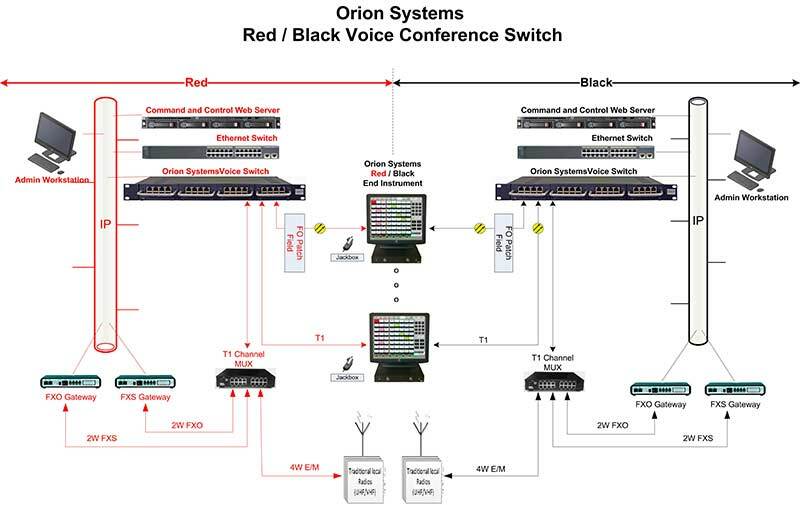 The Orion T1/E1 voice switch can be customized to your Red/Black communication environment. Built to handle traditional telco interfaces, Fiber networks as well as IP based communication networks. Orion Systems engineers are experts in securing radio communications from COMSEC devices and the switching required between secure and non-secure audio. The Red/Black Radio Voice Switch consists of separate Red and Black Voice Switches. Each Voice Switch is comprised of a 1 rack unit chassis, motherboard, and fiber optic modules. The Voice Switch can be equipped with either 1 or 2 fiber optic modules. Each module supports up to 8 fiber interfaces for a total of 16 fiber interfaces per chassis. Telephone interfaces are available for both traditional Telco (FXO & T1) and SIP extensions. Telephone features and a telephone to radio patch are standard in our units. The Voice Switch equipment is built with redundant common components such as dual power supplies, dual voice processing logic, and are equipped with a main and standby microprocessor.